It’s day three of the Dave from Albury T-Shirt Challenge and the competition is really hotting up. There are three more shirts below the fold today, the last for this week. 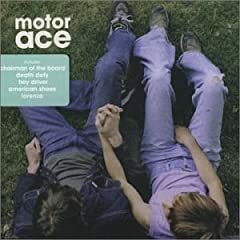 Is #3 a Motor Ace album cover? Yep – Five Star Laundry. #1 a Superjesus tshirt making a reference to Sumo and to one of their own releases? That’s Sumo the sport by the way, and Sumo their album. Also, yesterday you said I had 3 points…. my missing point might be under the couch. Two points to Matt and three to 100flowers. Nope, #2 is most certainly not a generic surfer brand. Current theory then is that #2 is a geek reference to internet surfing, but that doesn’t really explain the words I THINK I see written on it. Dave are you deliberately winding me up? Or did you just forget that I bullied you into an extra point? As for the Ts, hey, I agree with another comment – I do not own one single T-shirt that has a logo on it. Well, correction, I have a Saints T-shirt from 1995. I think we finished last that year, which is where I’m going to come here. I’ve no idea whatsoever of what they are about. Let’s move on to something slightly more riveting, like trainspotting. As odd as it is, Ray, t-shirts are actually a bit of a phenomena. It’s weird, but it’s there. Lee, I’ve suspected that for some time, but I haven’t had the heart to tell you. Class requires no description, ergo logos on Ts = very uncool. Dave – does it count if I guess number 2 given I actually bought the shirt for you at the (as yet un-)said bands concert? Al, you are more than welcome to guess number 2. In fact, have a point for ‘guessing’ that you bought it for me. No problems…Pearl Jam – Yield Tour 1999. Shirt bought at Brisbane show. Awesome gig. Do you know, if you put Sumo Superjesus t-shirt into Google, this page comes up as the third link. I have some bad news for you Alex, you get a point for identifying that it’s a Pearl Jam shirt, but it can’t have been 1999 because you got it for me before I moved to Albury. I think I look pretty damn fine in this attempt to garner some extra bonus super duper points. I can’t argue. 2 points. Oh… And 100Flowers wears the Whitlams shirt a damn side better than you Dave! Don’t you own any decent band’s Ts Dave? Stones, Doors, Beatles .. that sort of stuff? What about The Who? I’d even recognise these (more recent) bands: Hoodoo Gurus, Matchbox 20, ColdPlay (see, I’m not that uncool). Matchbox 20? Are you trying to be docked points? What’s wrong with Matchbox 20? Do you have a “disease”?